One of my big themes this week, and one that I was unaware would be a theme until I started writing all these posts, is the importance of variety and diversity in the blogosphere. I have been heartened to see that there are a few like-minded souls out there, blogging on less mainstream fare and content to cater for the few, rather than the many, exposing little-known books and authors to the eyes of the select group who occasionally drop by these back streets of Lit City, content to leave the bright lights of the glitzy blogs behind for a while. As well as encouraging the promotion of niche literature in general, I am keen in particular to espouse the reading and reviewing of foreign-language fiction, in my case German, French, Japanese and (to a lesser extent) Russian novels. If there is one criticism I would level at blogging in general, it is that it can concentrate on contemporary American and British literature at the expense of classic and foreign-language works, a focus that can only be bad for the medium as a whole. Just as more multi-cultural cities (hopefully!) means a more vibrant and tolerant society, a broader focus in your reading can open your mind to different ways of thinking, similar to the effect of learning a foreign language (and much easier and cheaper!). It’s hard to say what I love about Japanese novels, but if pressed, I would say that it’s the nuances of the prose and a focus on surrounds, rather than a plot. Whether it’s the tranquility of Natsume Soseki, the barely-repressed hostility of some of Yukio Mishima’s work or the simmering sexual tension depicted by Jun’ichiro Tanizaki, the end is rarely as important as the means of arriving there. Some of the descriptive writing about nature is simply breathtaking, and it’s easy to forget, or to overlook, the fact that this description is often conveying ideas which the untutored may be unaware of. Naturally, if you do not read Japanese (and, like most fans of J-Lit, I don’t), you are at the mercy of the translators, at times an unpleasant position to be in. Luckily, Japanese authors seem to have a plethora of skilled translators, mainly American, ready to convert their work into English worthy of the original. I posted earlier this year in detail on this topic (and touched briefly on the issue of American translations in a recent review post), so I won’t go over that ground again today, but I would like to reemphasise my gratitude that someone has gone to the effort of bringing these works to an English-speaking audience. The second area I want to touch on is one which I, fortunately, am able to enjoy without the intervention of a translator. 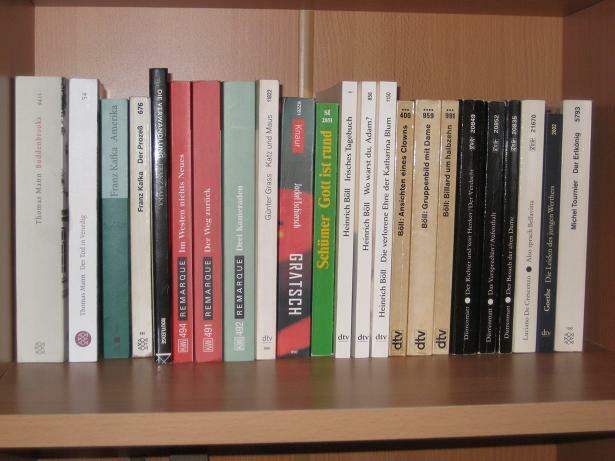 I have been reading German-language literature, on and off, since my school days, and the last couple of years have seen an increase in the number of books I have read in this language, allowing me to make the most of my otherwise fairly useless Bachelor’s Degree in Modern Languages. Despite some difficulties with vocabulary and style, I have enjoyed my forays into German-language classics, revisiting old friends like Kafka and Dürrenmatt, and discovering the joy of Goethe and Mann. Of course, when you get to later German literature, it’s impossible to avoid a certain topic, and two of my favourite writers deal with the events, and consequences of the respective World Wars. Erich Maria Remarque, best known for his novel Im Westen Nichts Neues (All Quiet on the Western Front), wrote about the difficulties faced by civilians and returning soldiers in post-WW1 Germany, describing the situation which allowed the Nazis to rise to power. Coming from the other side of the front, reading Remarque’s work has been an eye-opener, leading me to rethink my ideas of what actually happened during the wars. The fact of his books being burned by Hitler’s regime is proof enough of the importance of his novels, and I have thoroughly enjoyed the three I’ve read so far. Probably my biggest discovery of the past few years though has been Nobel Prize winner Heinrich Böll, whose works are set during and after the Second World War, analysing the guilt and responsibility Germans felt (or pretended to feel) once the fighting was over. Many bloggers have commented that they aren’t interested in War literature, but the themes and issues covered here are just as relevant today, in an increasingly-fractured world, as they were back in Böll’s time. This is fantastic. What a brilliant use of today's topic. I'm adding books to my TBR as we speak (I've never heard of some of these authors and I'm a huge fan of Japanese literature). You described the few Japanese novels that I have read to a T. With my little experience (only have read Murakami), it does seem as if “the end is rarely as imporatnat as the means of arriving there”. Perfect. I would like to read more Murakami novels and branch out with other Japanese authors. I am curious, what languages do you know? English, and German, I know from your posts but are there more? For me, only English. My daughter is learning French (loves it) and has a huge desire to learn Japanese. I hope she does. Translations: I have seen people say that a story was not smooth due to a poor translation. Or something along that line. I have wondered how one would know that unless they have read the book in both English and the original language. So for me, I am for sure at the mercy of the translator as I would have no clue if the story's greatness or otherwise was due to the translator or the author. I tend to only view the words as the authors. By the way: Love the title to this post…No passport required…perfect. I've only had the briefest experiences with both Japanese and German literature, and they were both positive. I need to read more foreign titles! Hi Tony, Great to discover you via BBAW, especially with this post. Funnily enough I've written a piece today which could go very well with yours – all about my wish for more attention to translated children's literature! As to translated works for grown up could I suggest The Book of Fathers by Miklos Vamos (Hungarian), and for something lighthearted Cheese by Willem Elsschot (Dutch). I speak/read Hungarian and Dutch and think the translations of both of these are good (and they're great stories). I luuvvvvvvvv…. your bookshelf, especially those Murakami and Mishima's collection. Tony, why did you say on my blog that this post was preachy! In fact, you've reminded me (in the nicest way possible) that I am very much guilty as charged when it comes to mostly focusing on American and British authors, and am therefore missing out (quite literally) on a whole world of literature. I have to say, I've tried Norwegian Wood and didn't like it – is there another starting point you would suggest. And at least 'All Quiet on the Western Front is my next book, so I'm not a total philistine. ibeeeg – My German is fairly good while my French is still good enough to read in (BA Mod. Langs. – Fr & Ger). I was up to intermediate Japanese (a long time ago), and I've also studied various other languages to different extents (e.g. Spanish, Polish, Arabic). As mentioned in the other post I linked to, translators are vital to your enjoyment of a book – sometimes as important as the writer! Zoe – See, now those are two cultures I'm fairly unfamiliar with; that's why we need more people reading and reviewing these books! ChasingBawa – Some people think War Lit. is all about the violence, but there's so much more to it than that. And, yes, read those Mitchell books! Lyndsey – Wait, you didn't like 'Norwegian Wood'? Then there's no hope for you 😉 Seriously, Banana Yoshimoto or Yoko Ogawa may be other routes into Japanese writing – Yoshimoto's 'Kitchen' is a common starter book, so you might want to give that a try. Always willing to give new genres a try, I never say never. Many thanks for these recommendations. I hadn't realized that Erich Maria Remarque had written books other than All Quiet on the Western Front, which I read in high school and loved. I have had good intentions in the past about reading books written by foreign authors, and then have gotten so busy reading other things that I never get around to it. 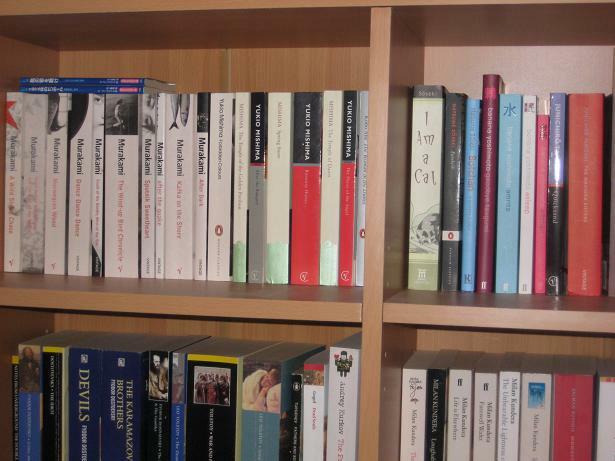 This post was an excellent reminder of the worth of reading books from other cultures. I love reading war books and am always on the lookout for good authors in the genre. I haven't heard of Heinrich Boll – thanks for the recommendation! Wonderful post as always, Tony, and I wholeheartedly agree with you. I touched on reading foreign lit briefly in my own post which is finally up. Your enthusiasm for JLit is infectious, love it! I love Japanese novels as well and I really need to spend more time reading them. Thanks for using your blog to spotlight lesser known books! I agree with you Tony that to really get a sense of what's happening in the world you have to read from as wide a variety of settings as you possibly can and (being woefully monolingual myself) it has to be done through translated works. One of the ways I have been expanding my horizons this year is by participation in the Global Reading Challenge which requires reading books set in different parts of the world and most of the books I've read for this challenge have been translated. I've got my first Japanese book for that challenge due up next on my reading pile (it's a crime fiction work by Shuichi Yoshida called Villain) and I am looking forward to it. I love reading world lit too! Although, I don't read as much translated stuff as I originally thought, since a lot of my favourite African and Asian authors write in English. I haven't read much German lit (I did read one of Goethe's this year and really enjoyed it! ), so this suggestions were great. 🙂 And since I've read and enjoyed both Mishima and Tanizaki, it sounds like I need to get my hands on some Soseki! Alyce – That, 'Coming Home' and 'Three Comrades' form a sort of trilogy (no overlap of characters but a progression in time), moving from war, to post-war euphoria and depression, to Weimar republic unrest. His books are like a little slice of a certain time in Germany – uncensored by the Nazis too. Amy – Thanks for that, and thank you for the whole week too! Bernadette – It's definitely good to expand your horizons – the wider the better (although I have heard of some intrepid bloggers who plan to read a book from all 200+ countries in the world!). Eva – Natsume Soseki is one of my favourites this year. 'I am a Cat' is a classic, but 'Botchan' and 'Sanshiro' are probably easier as first reads. Interestingly, Natsume is the family name, and Soseki is a pseudonymous given name – for some reason, that order sticks for him in English while most other Japanese authors' names are reversed when used in English (why his isn't usually, I don't know!). Oh thank you for this! I am trying to read a lot more world lit. And I've been enjoying J-Lit this year thanks to Tanabata as well. And, I share a penchant for Russian literature, too. My two favorite genres besides the old classics. I'm so glad that you found the JLC, as I'm glad to have found you.